Historic music venues like Antone’s Nightclub have long been a part of Austin’s culture. For the third year in a row, Capital One transformed Antone’s — which helped Austin claim its title as the Live Music Capital of the World — into the Capital One House during SXSW Interactive. 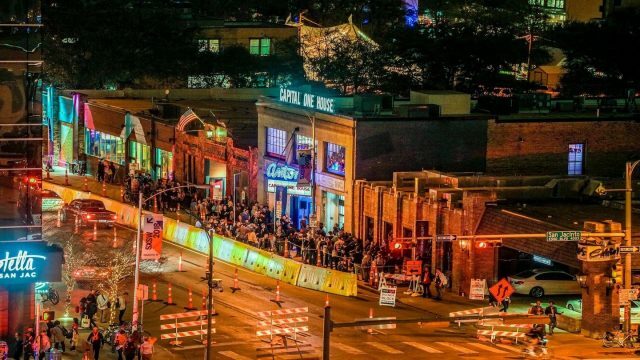 Co-owner of Antone’s, Will Bridges, shared his thoughts below on partnering with Capital One and why it’s important for Antone’s to stay involved in the SXSW conference. As an Austin native, what does Antone’s Nightclub mean to you? What inspired you to take on co-ownership? Some of the greatest artists of all time have performed at Antone’s — from B.B. King and Ray Charles through Willie Nelson, Muddy Waters and Gary Clark Jr. to Lady Gaga and U2. Antone’s has always been the centerpiece of Austin’s music culture and history — thanks in large part to the incredible person that Clifford Antone was. He treated musicians like royalty and made them feel like anything was possible. By doing so, he inspired and nurtured many successful careers and established Antone’s as a venue that emerging artists and living legends alike aspire to play in. When the fate of Antone’s was uncertain, my partners and I felt a powerful calling and responsibility to take over the club. In doing so, we’ve been handed the “cultural torch” that Antone’s represents and are now dedicated to stewarding the legacy of Clifford Antone and his beloved blues club. What was your strategy when reopening Antone’s in 2014? First and foremost we wanted to make Antone’s a blues club again. We studied the best attributes from the five previous locations of Antone’s, primarily the original at 6th and Brazos and the third location on Guadalupe, and looked for ways to incorporate that history and texture into the new space. Then, we built Antone’s programming around a “what would Clifford do” philosophy to make sure the music and artists we showcase maintains a caliber and integrity he would be proud of. How has SXSW evolved the music scene in Austin? Why is it important for Antone’s be in the mix? Every year SXSW puts Austin in the international spotlight, allowing us to show the world what our music scene and culture are all about. It’s imperative that clubs like Antone’s participate because they represent our organic infrastructure and the overall health of our local music economy. I like to say that the clubs and venues are like a coral reef and the artists and industry professionals are like the sea life. If the reef isn’t healthy and supporting its inhabitants, they’ll be forced to go elsewhere. If the reef is vibrant and growing, not only will it support its population but it will attract others. SXSW helps us to keep growing and evolving as a city and creative community. What has it been like to partner with Capital One during SXSW? We couldn’t have dreamed of a better SXSW partner than Capital One. Their team is so amazing to work with, and every year we’re blown away with how they transform our space in creative ways while still maintaining the authenticity. The Capital One House is without a doubt the best SXSW activation I’ve been a part of in my 14-year history of working the conference. It’s exciting to be a part of the event, and it’s definitely one of the highlights of the year for my staff and myself. We hope to continue the tradition and value The Capital One House brings into the future!